The Index opened huge up around 8181 and went on to touch 8250 only to be sold off to the lows of the day around 8090. The responsive buyer took control from thereon to move the index back above 8200 and close near the highs at 8235.45, huge gain of 108.50 points. The broader market was positive, with 980 advances to 509 declines. Developing Range as per Option Table stays at 8000-8500. Call option 8700 added 0.70 lacs OI with huge short covering seen at 8300 and lower strike prices. 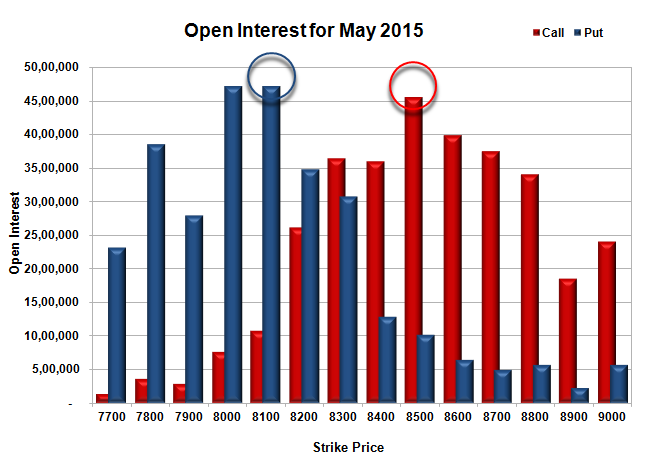 Put option 8000-7800 added 3.18 lacs OI with short covering seen at 8300 and above strike prices. 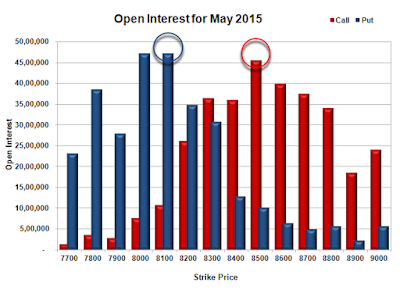 Nifty Open Interest is at 1,38,66,675 down by 2,27,725, with increase in price, most probably huge short covering. 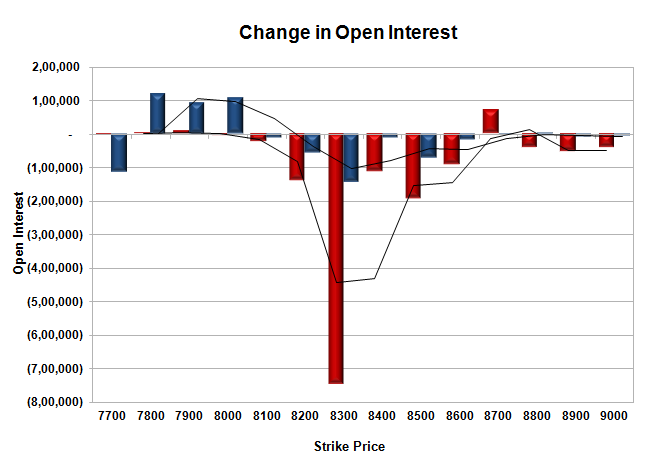 Bank Nifty Open Interest is at 16,81,950 down by 1,76,375, with increase in price, most probably huge short covering. FII’s sold huge 6.58 lacs Futures, which includes 2069 contracts long build-up and 28383 contracts short build-up, with increase in net OI by 30452 contracts (includes 100260 longs to 126574 shorts for the day) and the Average Price comes to 8953.04. FII’s Index future open contract as on date is 235163 Longs to 215111 Shorts, net long just 20052 down huge 26314 contracts. 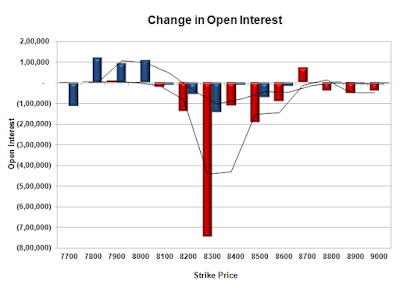 Initial support at 8200, with OI of 34.86 lacs and below that at 8100 with highest OI of 47.19 lacs. Initial resistance now at 8300, with OI of 36.49 lacs and above that at 8400 with OI of 35.98 lacs. 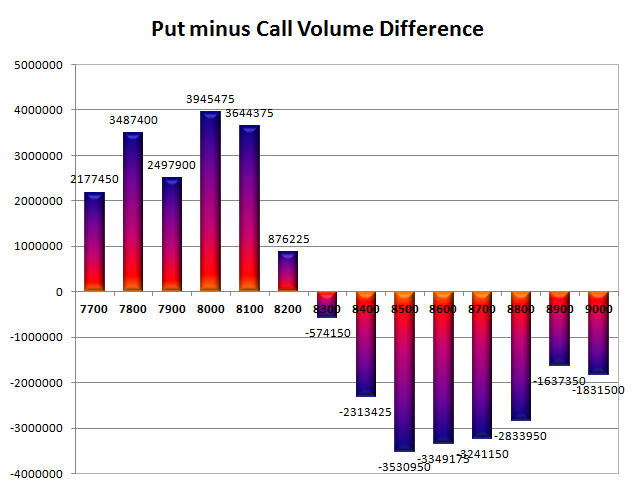 Day Range as per Option Table is 8095 - 8314 and as per VIX is 8146 - 8325 with 8193 as the Pivot.